Monologues and training to awaken scientific vocations. One of the great challenges of education at European level is unmet demand in science and technology-related professions (STEM: Science, Technology, Engineering, Mathematics). These contribute significantly to increasing the productivity of our neighbouring countries’ economies. This need is particularly evident in Spain, where most young people cannot develop their professional potential to the full. The Fundación Telefónica Education Challenge project was created to meet this need. Its aim is to identify, make visible and open up opportunities for implementing the best innovations developed worldwide in relation to this key challenge for education. The Big Van Theory is a group of stand-up scientists who explain science in a fun and accessible way in high schools. The team comprises researchers in various fields, from biology and chemistry through to mathematics, geology and engineering. The project has been acknowledged as one of the 100 top science educational initiatives in the world, according to Fundación Telefónica’s ‘Top 100 educational innovations’ study. The Big Van Theory visited six Spanish cities during 2015 to train high school students and teachers on how to incorporate humour into science teaching. Alongside this initiative a competition was held among students, who has to prepare their own monologues on subjects from the curriculum. 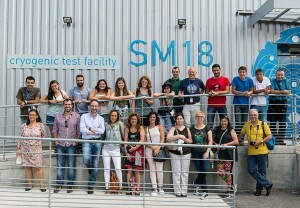 The authors of the best monologues won a visit to CERN, the European Organization for Nuclear Research, in Geneva (Switzerland). During 2016 a new tour is going on around Spain spreading science with humour in cities suich as Madrid, Murcia, San Sebastian or Santiago de Compostela among many others. During 2016 a new tour is going on around Spain spreading science with humour in cities such as Madrid, Murcia, San Sebastian or Santiago de Compostela among many others.